Although a classically trained CPA, Alexander’s career path spanned several industries ranging from real estate, technology, and short film production. Under his leadership as co-founder and CEO of BCD Travel, the company grew from a local travel agency to the third largest travel management firm in the US with $350 million in revenue. Business Travel News selected him six times as one of the top 25 most influential executives in the travel and hospitality industries, and Ernst & Young gave him the National Entrepreneur of the Year. As a business leader, Alexander understands that the key to professional success is applying values steadily to one’s daily life and recognizing when you fall short of those fundamental principles. Alexander cited a time when he called upon his office staffers to work 80 hour weeks to prepare for an Olympic event. After the event, he reflected upon the experience and realized that he subjected his employees to too much stress. By acknowledging his shortcoming as a leader, Alexander apologized to his employees and gave them bonuses and vacation time for their efforts. “Integrity is not only doing the right thing but being honest when you haven’t done the right thing. Service ethic is important as a leader. People want to know what are you going to do for them,” Alexander stated. Alexander takes a hands-on approach to leadership to understand what’s happening on the ground level of his companies. “If you sit in a corner office, you don’t know what’s going on. You need to get close to a thing to understand it. You need to make sure that you are intersecting with people that are different from you.” Alexander referenced a business situation when he evaluated the performances of various offices across the country. Instead of firing the employees in the underperforming office, Alexander visited the facility to understand the issue first hand. By speaking with the staffers on site, he learned that their headsets didn’t fit properly and were causing the employees headaches. Alexander rectified the problem with the purchase of new headsets and the office began to perform in line with the other office locations. 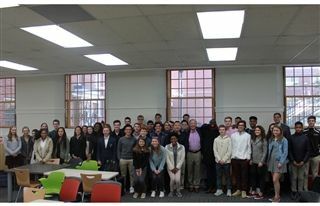 Due to the competitiveness of the job market, Alexander challenged the students to be versed in two skill sets, for instance, technology and sales or finance and marketing. He stated, “The broader the base, the better off you’ll be.” But, Alexander noted that technical skills and knowledge only take a person so far. "I can't stress the importance of people skills that are grounded in values and excellence enough," he said.